PIOMAS data is now out. So here is a summary of the data based on the gridded data provided by the PIOMAS team. Once again thanks is due to the PIOMAS team for making this data available and up to date. First a look at the PIOMAS main series, available from the PIOMAS website as a numeric file suitable for spreadsheets. Throughout the early part of this year volume has failed to rise as much as in recent years resulting in volume falling relative to recent years. Volume anomalies are now at the second lowest by the end of February. 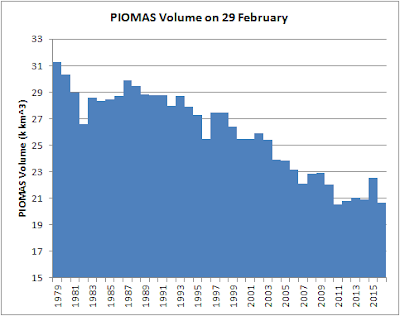 That means volume is the second lowest on record since 1978 at 20.660 thousand km cubed (k km^3). Note that as 29 January 2016 is in a leap year its corresponding day in a non-leap year is 1 March, both are day 60 of the year. Since 1 January volume growth has been relatively low, but despite record warmth across the Arctic Ocean it has not been 'catastrophically' low. As I have pointed out recently this is because despite warm temperatures it has still been far below zero (more here). 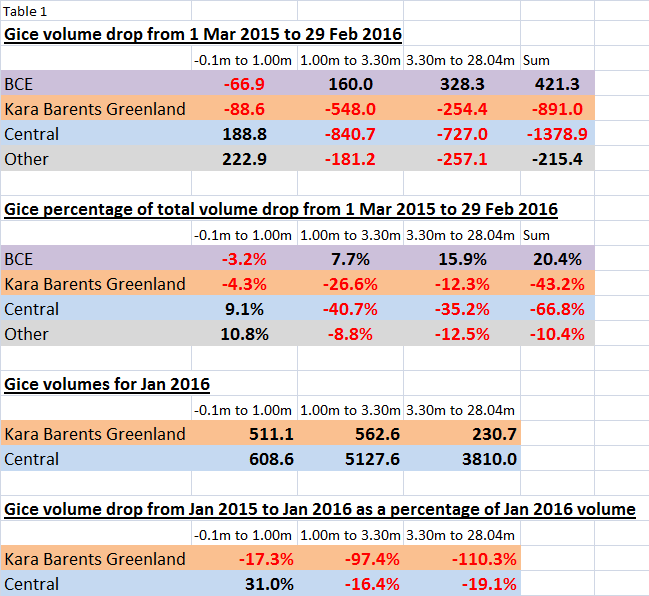 The regional difference between 2015 and 2016 shows the same general pattern as on 31 January, and aside from the Atltantic influenced regions (Kara, Barents and Greenland Seas), volume is not exceptionally low. Gice is the sub grid thickness parameterisation used within each grid box of the PIOMAS model to model processes at smaller than grid box scale. 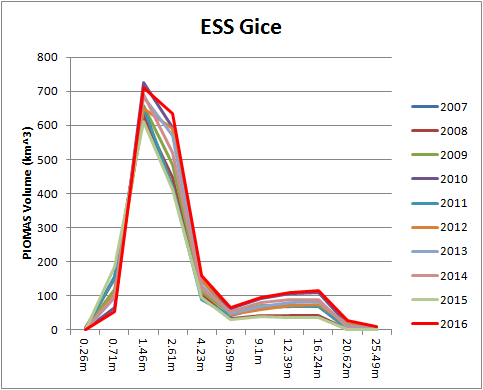 Using Gice allows the examination of how volume is distributed in thickness bands. More on Gice here. In the following gice plots I show the thickness bands along the horizontal axes, and volume along the vertical axes. So the Atlantic influenced regions are Kara Barents and Greenland, regions used here are the same as for Cryosphere Today. Comparing this year with last year there has been a collapse of ice volume for thickness of around 1m and thicker. However as shown previously this region probably plays little role in the setting of the minimum extent in September (see the scatterplots in that post). 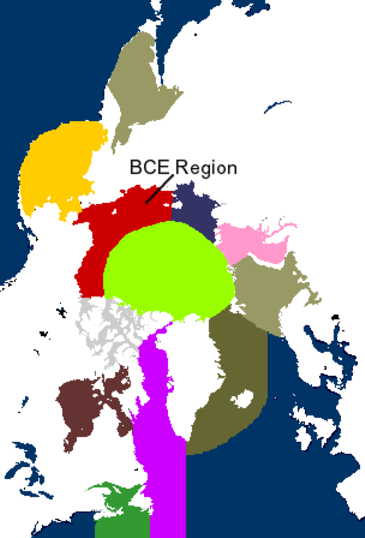 More of importance in the September extent minimum is the region within the Arctic Ocean Basin bordering the land, I have called this the BCE region (Beaufort, Chukchi, East Siberian Seas). 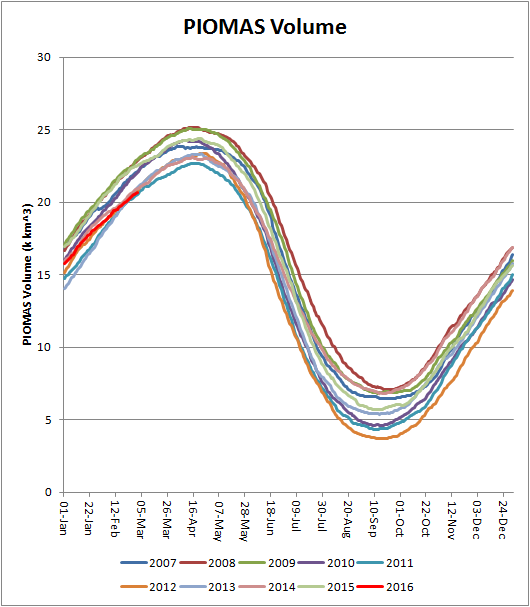 Rapid early melt here opens up the possibility of large losses in the Central Arctic. Sea ice thickness in the seas of the BCE region is similar to other recent years and continues the pattern of convergence on an April thickness of around 2m as the region has transitioned to a seasonal ice state dominated by first year ice. 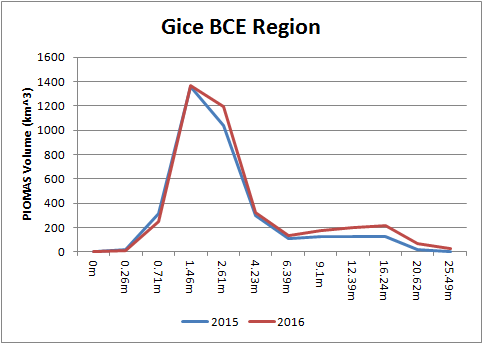 Gice in the BCE region shows that while the peak volume from first year ice (around 2m) is down from that of 2015, there is more thicker ice. 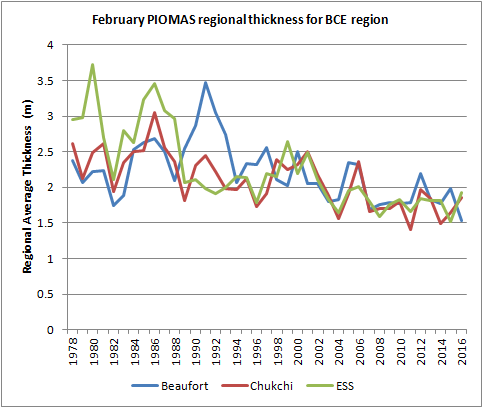 However as the thickness plot above, and the regional volume difference plot (5th plot in this post) shows, Beaufort seems weak. 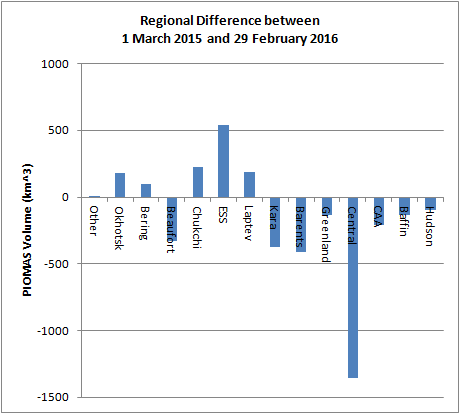 Volume and thickness in Beaufort are low on 29 February 2016. 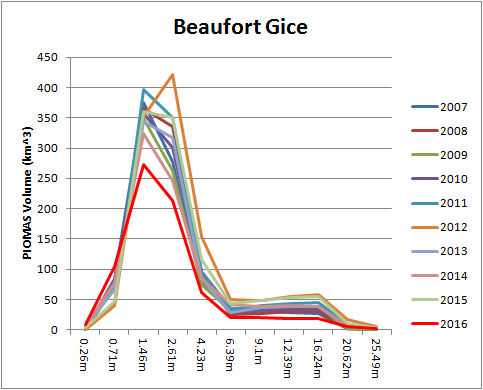 Indeed Beaufort is the weakest Gice profile of the post 2007 period. But compare this to the East Siberian Sea, where ice is in a very strong state, in terms of both first year ice and ridged or imported multi-year ice. Now to the Central Arctic region, the largest region of the Arctic Ocean and the region that must suffer large inroads of ice in order to allow a record low like 2012. The thickest ice (green trace) is lower than 2015 by a larger margin than it was on 31 January 2016, but there is still more of the thickest ice than in other recent years. 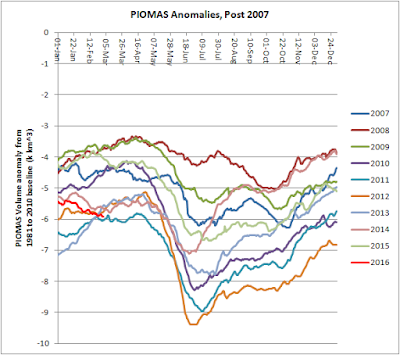 Indeed, excluding 2015, one has to go back to 2005 to find higher levels of this thickest ice, and PIOMAS uncertainty makes day 60 of 2016 a virtual match for day 60 of 2006. However lower thickness (1m to 3.3m - red) is down and the thinnest ice is up, which suggests a general downward shift of thickness. 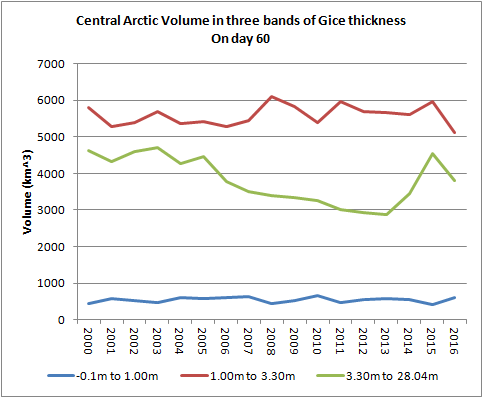 Gice in the Central Arctic shows this volume shift to lower thickness. So how to summarise the position? I reproduce the table presented in my post on 31 January ice state, now updated for 29 February 2016. 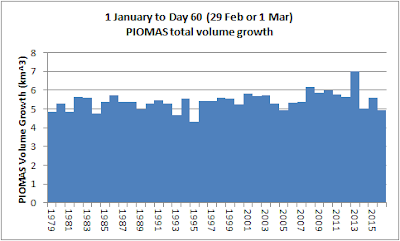 With the record warmth continuing into February the attribution of the volume loss has changed substantially from 31 January. 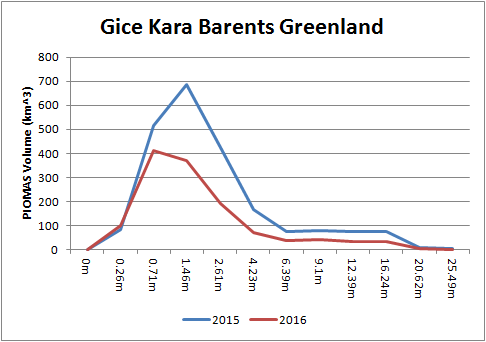 At the end of January 57% of the difference was from Kara, Barents and Greenland (KBG). Now at the end of February 67% of the difference between 2016 and 2015 is from the Central Arctic. This is in roughly equal proportions from ridged and multi year ice (thickest) and first year ice. First year ice in the Central Arctic is at record low levels, but is not 'catastrophically' low. 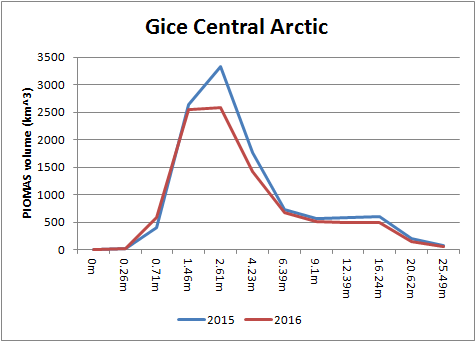 As a proportion of the 2016 volume first year ice loss for the Central Arctic is only 16%, in contrast to the substantial 97% proportional loss in KBG. The situation for thicker ridged and multi-year ice is similar. I'll close with regional volume for day 60 post 2000. As usual Central Arctic (black) is on the right side scale, all others on the left. Barents and Kara are very low, but I am not convinced they play a strong role in the September minimum. 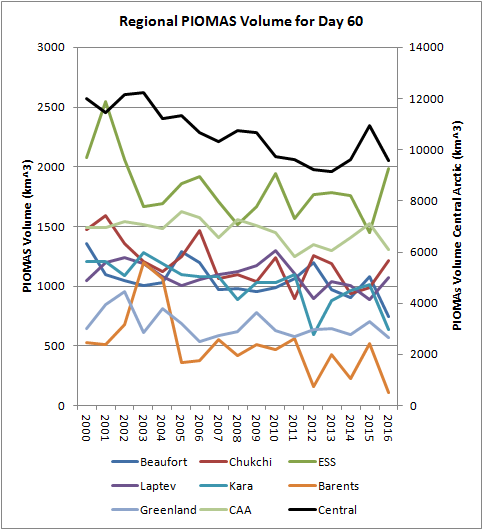 Aside from that volume in Beaufort is very low as it was in 2012, but weather was the dominant player in 2012 (leaving aside the obvious role for long term volume decline). Aside from those regions to watch this summer I struggle to see persuasive grounds for expecting an imminent crash by September. I certainly don't see a general collapse in volume. But it's late, I've had an 11 hour day at work, and I'm very tired. I'll have a look at the data over the weekend when I'm rested to see if my opinion changes. Chris, Wayne Davidson reports first signs of bottom melt on South Cornwallis Island (75N) on March 7th. In comparison his past sightings were 2015 first melt was March 26, 2014 April 10, 2013 March 23, 2012 March 17, 2011 April 15 and 2010 March 19. Ten days earlier than 2012 and nearly two weeks earlier than 2010. I attribute this mainly to the ice core temperature - something I've long thought gets overlooked. Others like to point out that it's only a %5 or 6% headstart on the energy required to melt the ice, as if 5% or 6% is nothing. I'm not sure they realize that - for instance - a 3C rise in global temperatures is a 1% increase. It's similar to the CO2 is only 0.04% of the atmosphere logic. With thinner ice and warmer air temperatures the ice just isn't as cold and can start melting earlier. A deep cold snap over the next 3 to 4 weeks could repair some of the damage, but the sun is getting higher in the sky for longer periods each day. I am undecided about the role of ice temperature. It is correct that the amount of energy needed to warm a block from say -10 to 0 degC is a small fraction of the further energy needed to melt that block of ice. Enthalpy of fusion is 334j/g, specific heat capacity of ice is about 2j/gK (varies with temperature!). However as you point out this may not be the proper viewpoint. Given the compounding nature of absorbed insolation through the melt season it seems that the proper view might be one of making melt start earlier. Without the sun, if one takes a cross section of 2m thick ice, the base is constrained to -1.8degC, there is a temperature gradient through the ice and the ice at the surface is the temperature of the atmosphere. Once the sun rises the surface can assume a temperature of zero (due to surface ice melt), but the interior cold of the ice draws heat away from any planar surface melt. A key issue here is the thermal time constant of the mass of ice. A = area through which heat flux acts. My doubts are simple. In a practical atmospheric/ocean situation with practical warming out of the cold of the Arctic night is Tau so long that a warmer mass of ice is significantly more prone to surface and/or basal melt? The practical implementation of this equation doesn't seem simple to me. Regards the sea ice state at present. Some thickening into April will be seen within the Central Arctic, but I see little chance of a 'recovery' from what damage has been done from the warm Jan/Feb. Beaufort is now an interesting game, thinner ice thickens more readily. But will that effect beat the thin initial state as we enter the Arctic spring? I suspect not, and that Beaufort will enter the summer in the poor state it is now. That said the big wildcard is what export will happen from the Central Arctic? 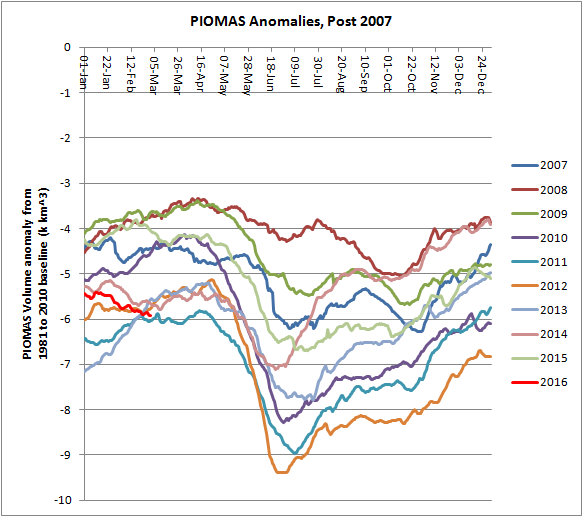 I suspect my PIOMAS Arctic Ocean Volume prediction will be at the lower end of the post 2007 September extent. If there is going to be an extremely low extent the earliest indication will (IMO) be the spring melt from late May to late June. If preconditioning due to thin ice is to play a large role this summer we will likely see a very large spring melt anomaly. What is interesting about maximum extent?